Hi Dolapo! Tell us a little about yourself. Where do you live, and what do you do (if anything) besides running Urbanknit? I shuttle between Lagos (Nigeria) and London (UK). I am a chartered Architect and sometimes work on building projects when I am not working on Urbanknit. 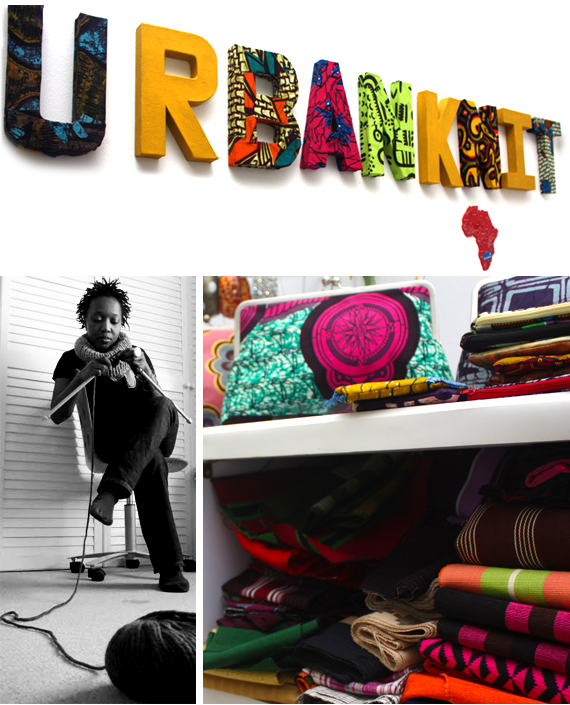 What was the inspiration that led to the creation of Urbanknit? How did you get started? 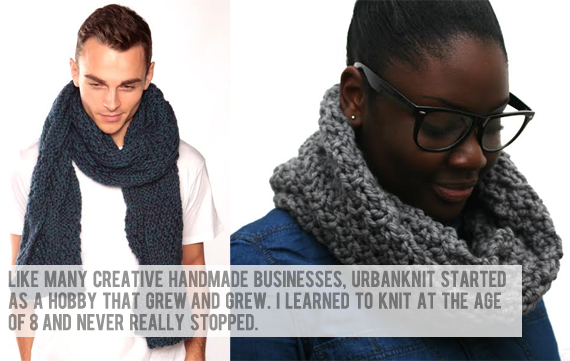 Like many creative handmade businesses, Urbanknit started as a hobby that grew and grew. I learned to knit at the age of 8 and never really stopped. I then bought a sewing machine to experiment and I think I am still experimenting. Tell us about the company itself. What is Urbanknit's mission? Urbanknit was started in 2006 with the aim of providing fresh and interesting handmade fashion and home accessories that offer the wearer a sense of individuality with something unique and unusual. 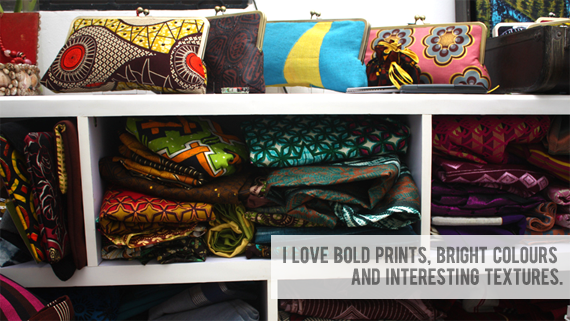 I love bold prints, bright colours and interesting textures. 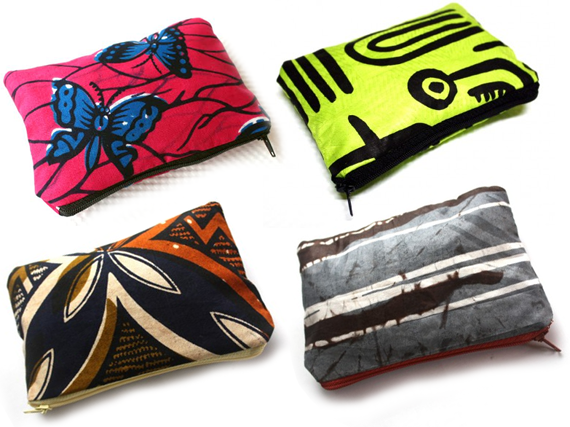 For that reason I love using traditional African prints and fabrics, combining them with modern fabrics like denim, corduroy, silk and cotton to make accessories that are durable yet interesting thus mixing colours and cultures where the old tradition meets the modern world. What types of things inspire you in your work? Are there any designers or other businesses who have influenced you creatively? I have a random collection of inspirational sources. Wandering through museums and looking at all forms of art, wandering through cities with a camera, cartoons, art, graffiti, music, signage, postage stamps, postcards. Like I said random! I like the Brand Moo, British designer Paul Smith, the architect Mies Van Der Rohe and the artists Roy Lichtenstein, Mark Rothko and many more! The Bubby and Bean blog focuses on living a creative lifestyle. 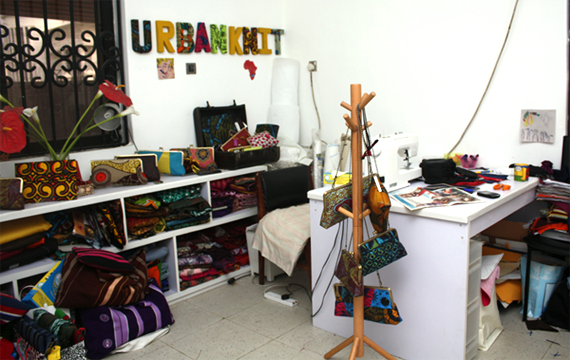 Aside from designing for Urbanknit, are there other creative endeavours that you participate in or find interesting? I love my camera. I am by no means a 'proper' photographer. I get told off all the time by friends especially those more savvy with the camera, that I should stop shooting things on the dreaded 'Auto' setting. I have a regular feature on my site called 'Urban Journeys' which is a series of random shots taken wherever I find myself. When I put these up on Instagram, they create by far the most conversations. I also like collecting postcards from any new place I visit; a new city, country, museum or even an event. I was looking through my collection recently and felt quite proud of it. They also bring back memories of a certain time or experience. From Roy Lichtenstein art to image of Unite de habitation or a Barcelona landmark all on a portable little postcard. Very cool. This changes every week. I really do try not to make anything I don't like or wouldn't use. My steady companion would be the zipper pouch though because it has so many uses, I have so many. One for my iPod, one for make-up on the go, one for my external hard. You get the picture. As they are brightly coloured they are easy to spot in my cavernous bag or in my sometimes hectic world. In funky quirky boutiques in the worlds cool cities. Tokyo, Amsterdam, New York and more! I would also like to collaborate with other creative businesses as well as being the employer of more labour because of the impact and multiplier effect this can have on individual lives. My all time favourite movies are The Departed for the fast paced often clever dialogue and The Sound of Music because it is 'happily ever after' and reminds me of being a child. Oh yeah, I also LOVE Disney's Little Mermaid, for the singing! My default when I am really hungry is anything that comes with chips/fries ( I am so not a foodie). Impossible for me to choose a favourite colour but this year I think it is Deep Indigo. A music favourite is even more impossible. Too many to choose from! Thank you Dolapo for sharing a little about yourself and your work with us! 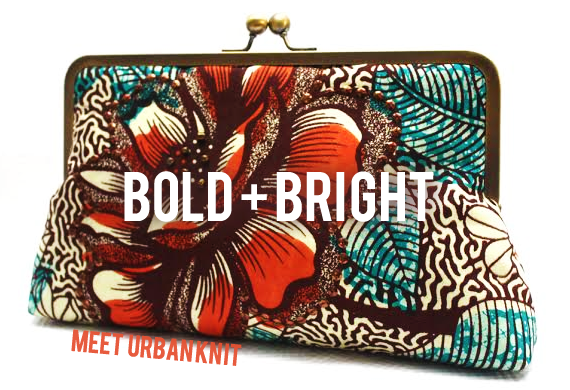 Make sure you guys stop by Urbanknit so you can see all of her gorgeous designs for yourself. And stayed tuned for a very special Urbanknit giveaway here at Bubby and Bean! Dolapo has also generously created a special coupon just for Bubby and Bean readers: Take 20% off your entire order at Urbanknit with code BUBBYANDBEAN. You can also find Dolapo on her blog, Facebook, Twitter, Pinterest, and Instagram. Love all the prints and colours! 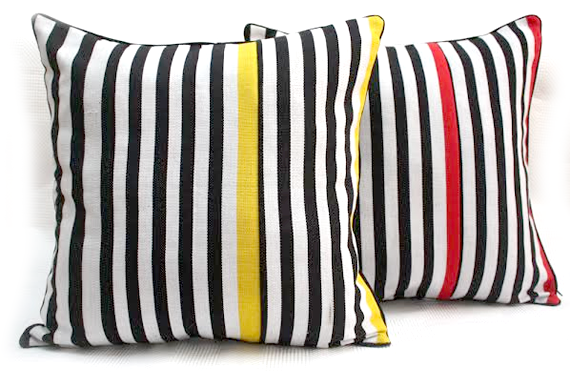 Wonderful shop, I love the striped cushions so modern, lovely and bright!